Important: Tracing can over-run your entire disk, and will cause substantial drops in performance. It is vital that you disable tracing once any issues have been resolved. The general principles of ODBC tracing and Driver debug logging are the same for all drivers and all platforms. There are some differences in specific implementations. Please follow the instructions relevant to your deployment. These options are case-insensitive, so, for instance, $p has the same effect as $P. This would produce separate iODBC trace files and OpenLink driver debug logs with names based on the userid, timestamp, and processid of each connection made. Note that these tokens have no effect on MDAC (Windows driver manager) trace files, but they do have effect on driver debug logs produced on Windows. Quit all ODBC client applications. Open your Data Sources (ODBC) control panel (often found in the Administrative Tools subfolder). Locate the Log File Path field. Use the Log File Path field to specify the complete location of the file to which you wish to write the trace, e.g., C:\Temp\odbc.trace.txt. You may use the Browse button to locate or create the file, or specify it manually. If the ODBC client application(s) you need to trace will run as System or under any other user login than your own, click the Machine-Wide tracing for all user identities box. This option is often necessary, even though it doesn't seem like it should be. Click the Start Tracing Now button, and exit the Data Sources (ODBC) control panel. Reopen the ODBC client application. Locate the file(s) indicated in the log file path on the tracing tab. DISABLE TRACING ON THE TRACING TAB. Failure to do this will leave the logs running, which can overflow your disk, and will have significant impact on performance. Launch the OpenLink Client Configuration Utility, oplcfg32.exe. Click to the ODBC tab. Recreate your error message or error condition. Return to the Registry Editor (regedit), and unset DebugFile. Failure to do this will leave the logs running, which can overflow your disk, and will have significant impact on performance. Open a DOS or CMD window on your Windows client. Expand the HKEY_LOCAL_MACHINE\Software\OpenLink Software menu items. Locate the folder for the driver you're using, and the ODBC subfolder within that. Locate the DebugFile parameter. It will appear on the right side of regedit. When to trace — Use this option to turn tracing off or on. For a One-time only trace, the trace is made only for the duration of the next connection (which may be over sooner than you expect). Click the Apply button to make your selection active. This option corresponds to the Trace and TraceAutoStop parameters in the preference files. Custom trace library — Use the Select Library button to browse the machine for a library file that contains the code to intercept the trace output. This field should generally be left blank. When setting this parameter, you may use the Browse button to locate the library, or specify it manually. If specified manually, note that the location must be specified as it would be in a Terminal session. You may use ~/ as a shortcut to your user Home directory. This option corresponds to the TraceDLL parameter in the preference files. Log file path — Specify the complete location of the file to which you wish to write the trace. You may use the Browse button to locate or create the file, or specify it manually. If specified manually, note that the location must be specified as it would be in a Terminal session. You may use ~/ as a shortcut to your user Home directory. This option corresponds to the TraceFile parameter in the preference files. Trace Parameters in Preference Files — When the ODBC tracing parameters are changed, they are saved in the [ODBC] section of the ODBC.preference or odbc.ini file, whichever is active on your system. The following example shows the settings for continuous driver manager tracing to files on the active user's Desktop. Trace — This parameter corresponds to the When to trace option in the Tracing tab. Set to 1, tracing is on; set to 0, tracing is off. TraceAutoStop — This parameter corresponds to the One-time only option in the tracing tab. Set to 1, tracing will automatically stop after the next connection is closed; set to 0, tracing must be manually stopped. When tracing is automatically stopped, the Trace and TraceAutoStop parameters will both be set to 0. TraceDLL — This parameter corresponds to the Custom trace library option in the tracing tab, and is very rarely used. When setting this parameter, note that the file must be fully specified as it would be in a Terminal session, but without shell-escaping (i.e., spaces and other shell-reserved characters do not need to be escaped). You may use ~/ as a shortcut to your user Home directory. TraceFile — This parameter corresponds to the Log file path option in the tracing tab. When setting this parameter, note that the file must be fully specified as it would be in a Terminal session, but without shell-escaping (i.e., spaces and other shell-reserved characters do not need to be escaped). You may use ~/ as a shortcut to your user Home directory. Driver Debug logging may be controlled through the DSN configuration (different panes for different drivers). Similar to ODBC tracing, there is a checkbox for turning this log on and off, and a text-entry box by which to specify the target file. When set through a GUI-based Administrator DSN setup, debug logging is per-DSN. When manually set, debug logging may be per-DSN, or in the global [ODBC] stanza which applies to all DSNs. 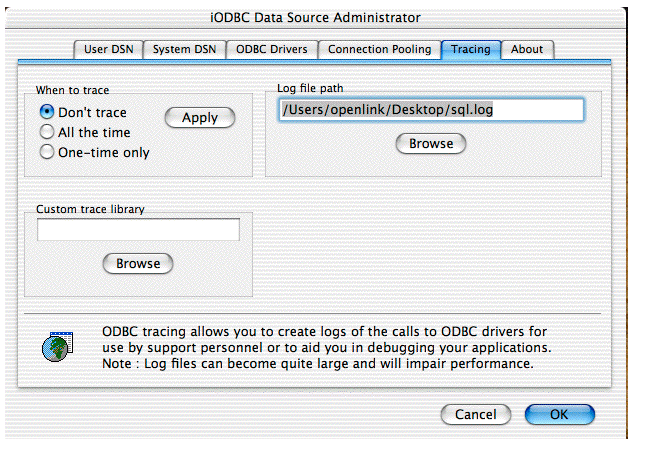 The following example shows the settings for continuous driver debug logging, for all DSNs and all OpenLink ODBC drivers, to files on the active user's Desktop. Debug — This parameter corresponds to the checkbox in the DSN configuration. Set to 1, logging is on; set to 0, logging is off. DebugFile — This parameter corresponds to the text-entry box in the DSN configuration. When setting this parameter, note that the file must be fully specified as it would be in a Terminal session, but without shell-escaping (i.e., spaces and other shell-reserved characters do not need to be escaped; it is as if the path were entered within double-quotes in a shell session). You may use ~/ as a shortcut to your user Home directory. Note: There is no Auto-Stop for Driver Debug Logging -- you must manually stop this logging. The Express Edition driver is a DBMS-specific bundling of our "Lite" Edition ODBC Driver for JDBC Data Sources (also known as ODBC-JDBC Bridge Driver) with a DBMS-specific Type 4 JDBC Driver. Sometimes, troubleshooting requires looking into the Java calls made by the ODBC-JDBC Bridge, and the responses from the JDBC Driver. Similar logging may be needed with our "Lite" Edition ODBC Driver for JDBC Data Sources, or our "Enterprise" Edition Bridge Agent for JDBC Data Sources. These calls are logged within the Driver or Agent Debug Log by setting an environment variable -- LOG_JAVA_CALLS -- to YES. Note that any active applications will not reflect the change; you have to quit and relaunch. A reboot or user log out will unset variables set with these commands, and you'll need to re-set them afterward. Persistent settings can be made through a launchd.plist, as described elsewhere. On Mac OS X 10.6 and earlier, this is best done by creating (or editing) a file called environment.plist in a (normally invisible) directory called .MacOSX, in the user's home directory. This method also works on Lion (10.7). -- where iodbc-filename is the full path to the file where the iODBC Driver Manager trace should be written. Tracing can be disabled by commenting out these parameters with a semi-colon (;), or setting Trace = 0. -- where iodbc-filename is the full path to the file where the Driver Debug log should be written. Tracing can be disabled by commenting out these parameters with a semi-colon (;), or (with the most recent driver builds) by setting Debug = 0.